There’s plenty of twisting in Joshua Harmon’s scorchingly funny, biting and provocative comedy/drama Bad Jews, set in a studio apartment in modern-day New York City. Daphna Feygenbaum, one of the main characters, can twist words with the best of them. But there’s nothing delicious or sweet about how she manipulates a well-meaning spoken statement, thought or opinion. When she’s done, the words sound like they sprung from the Wicked Witch of the West’s mouth. Daphna is Trumpian: A self-righteous, arrogant, sarcastic, narcissistic woman. Like “The Donald” she loves to hear herself talk. Words spill incessantly from her mouth like lava from a fierce volcano. Oh, and her hairdo is, shall we say, unorthodox. She doesn’t handle disputes or attacks against her well. We witness her at perhaps her worst; she’s embroiled in a bitter battle over a family heirloom in Bad Jews, running through Aug. 13 in Main Street Players’ 65-seat theater. The play is the Miami Lakes company’s third professional production after 40 years as a community theater. The finished product is a humorous, intense, riveting and even unsettling production that deftly mixes explosive emotion with nuance and subtlety. If Main Street Players keeps up this quality, it’ll be a South Florida theater with which to be reckoned for many years to come. The forces in Bad Jews contain all the ingredients necessary for a combustible afternoon or evening of theater. The forces, Daphna and her cousin, Liam, are two strong-willed, unbending people facing a situation in which they want something so bad, you’d have to kill them to pry it from their iron grip. The result is the kind of intense conflict that keeps eyes wide open and trained on the stage. Harmon packs many meaty and thought-provoking issues into his barely 90-minute, cleverly written and well thought out play, performed without an intermission. Among the issues we’re left to consider: religion, faith and how one expresses it, the importance of one’s past, how to best honor the wishes of loved ones who’ve died, respecting people’s points of view, the value of a family heirloom and who should be its rightful heir. The heirloom in the play is a necklace with the Hebrew word “Chai,” which means life. It belonged to the late grandfather of Daphna and her cousins, Liam and Jonah. The recently deceased Holocaust survivor, whose funeral has just taken place, took great pains to hide the Chai during his imprisonment. He later proposed to his fiancé with it. Now that he’s gone, the question is, to whom will it go? The explosive Liam, an atheist whom Daphna calls an anti-Semite at one point, insists grandpa told him to propose to his own fiancé with it. Daphna, who believes nobody is a better Jew than her, insists it only makes sense that she have it. Liam’s quiet brother, Jonah, doesn’t wish to inherit the Chai, but he’s caught in between. Another person who finds herself in the middle is Melody, Liam’s Christian girlfriend; He’s about to propose to her not with a ring. He wants to do so by giving Melody the Chai. Talk about situations that can turn into explosions. Ironically, in expressing her concern about intermarriage, Daphna comes across as the “bad guy” (or rather girl) in Liam’s eyes. He views her argument as a wish to keep Jewish people homogenous. Harmon doesn’t take sides. He doesn’t suggest any of the characters are “bad” or bigoted. 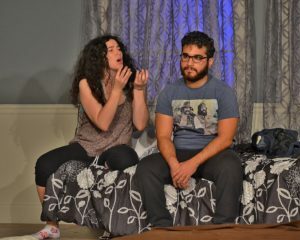 Neither does the playwright come out in favor of Daphna or Liam when the question arises as to who should inherit the Chai. Part of the beauty of the play is that nobody’s “right” or “wrong.” Many will leave the theater with a different opinion. We may even see some of ourselves in one or more of the characters. The cast comprises a talented quartet of young performers who disappear into their roles. Under Robert Coppel’s smart direction, the actors gradually build up in intensity for the explosive scenes. That way, they’re not worn out and the production simmers before the fireworks begin, building slowly to a ferocious climax. Jonah would appear to be an underwritten character; he doesn’t speak often and Harmon reveals little about him. He mostly sits in the background, practically becoming part of the set. But there’s a good reason for the character’s quietude – a gasp-inducing reason revealed at the play’s end that is particularly touching and heartbreaking. The moment vividly demonstrates how differently people respond to tragedy. As Jonah, Matthew Ferro’s mild-mannered demeanor and telling facial expressions are sometimes stronger than words. His cold stare at Daphna and Liam speak volumes about how he feels. When he speaks, it’s in a quiet voice suggesting indifference or a desire to keep the peace. But again, wait until the end of the play to see how Harmon has set Jonah up to be an important character. Joseph Paul Pino’s wide-eyed, bearded, doggedly determined Liam is like a starved wild animal ready to pounce at the slightest provocation. He puckers his lips to control his emotions (“count to 10, you imagine him saying to himself). It’s tempting to turn Daphna into a witch, but Hannah Benitez avoids the trap. Sarcasm and viciousness lie beneath her disarming charm. There are times when it’s hard to find much to like about her, but Benitez finds the vulnerability in the character. At times, she is obviously hurt by Liam’s harshness. Kimmi Johnson radiates curiosity and empathy as Melody. She makes her character nervous, well-meaning and optimistic. We feel for her when she’s on the receiving end of Daphna’s vitriol. The intimate theater and set designer Amanda Sparhawk’s compact design of the apartment give the sense that the characters are on top of each other. This adds to the claustrophobic aura, suggesting the characters couldn’t escape the volatile situation if they wanted to. There are plenty of funny moments in the play. With its seriocomic tone, it brings to mind the writing of Neil Simon. The play, however, is not escapist fare; it forces us to witness the type of divisiveness and hostility that’s tearing the world apart – and maybe do something about it.